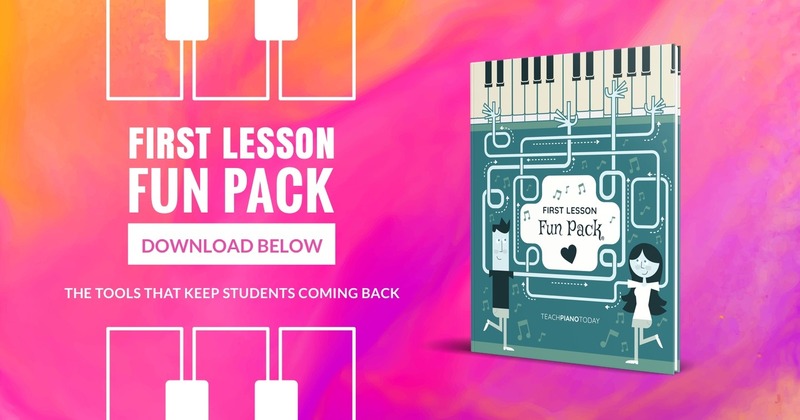 Welcome to Teach Piano Today’s First Lesson Fun Pack page. Andrea and I (Trevor) are thrilled to help you on your piano teaching journey… and what better way to start (or continue) on your journey than with some great resources! Your student signed up for piano lessons so it goes without saying that she should be making music from Day 1. With our first lesson teacher/student duet, your brand new student will be playing real music the moment her fingers hit the keys. The piano game below can be used during a first lesson to reinforce finger numbers. This game pack includes instructions, a game board, and 18 playing cards. We suggest laminating these supplies for prolonged use. I love activities that require little prep and can be pulled out at a moment’s notice. This is one of those activities. You can be up and running in the time it takes you to print out the Scavenger Hunt cards and grab two drinking glasses (I use red solo cups). To begin, label one cup, “True” and one cup, “False”. Next, hide the nine playing cards around your studio. Instruct your new student to search for the playing cards. When a playing card is found, read the statement on the card and ask your student to respond to the statement by placing the card in the “True” cup or the “False” cup. Piano teachers use photo props to recognize student achievement, decorate brag boards, communicate with parents and… celebrate first lessons. Print out one photo prop from the following pages, place it in a photo frame that your student can hold and then snap a picture of your new student at the end of the first lesson. Email the picture to the proud parents so they can celebrate this big day! Please remember: You must have parental permission before taking photographs of students. When it comes to “first piano lessons” however, you’ll want to recognize this milestone for reasons that extend beyond the emotional sphere. “First piano lessons” represent the start of your working relationship with new families. By kicking it off on a celebratory note you’ll firmly place piano lessons in the “important” category in the minds of both your students and their parents. But making a first piano lesson feel special does not need to cost you a bunch of extra time and effort. Something as simple as the email template on the next page will do the trick. Copy/paste the following template into your email and adjust as needed. Send it the day after your new student’s very first lesson.